For the aspiring musician without the paycheck to take lessons, computers have really opened up the traditional teaching field. Sure, programs like Garage Band’s Learn to Play probably aren’t going to give you the skills to play at Carnegie Hall, but they’re a fun and entertaining way to start. So it comes as no surprise that companies are developing musical teaching tools for portable devices like the iPhone, iPod Touch, and iPad. Etude, released Wednesday by Wonder Warp Software, is a prime example. 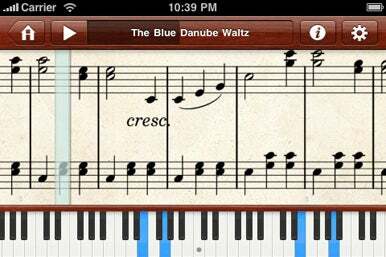 The app seeks to provide a different method of instruction to those learning piano: it combines a database of electronic sheet music with an on-screen light-up keyboard and audio playback of the piece. For those uncomfortable with sight-reading, the on-screen keyboard highlights the keys played throughout the piece. Additional settings allow users to change the tempo, enable auto-scroll, or hide the keyboard (great for more advanced players who want to concentrate on the sheet music). And discover, they shall—Etude has an in-app music store of over 300 songs (all free to download), with more coming in the next few weeks. Most of the music available currently is what you might find in a printed starter songbook—Moonlight Sonata, The Itsy Bitsy Spider—but the company is working with publishers to expand its library in the future. There’s also a song request form, if you’re so inclined. And if you want to boast about your newly mastered piece to the world, Etude offers integration with Twitter and Facebook. The app is currently available for the iPhone and iPod Touch for an introductory price of $3 and requires iPhone OS 3.1 or later; Wonder Warp is also working on an iPad version of the software, to be available shortly after the device’s April 3 launch.